Type better than ever with the all-new Family Edition of Mavis Beacon Teaches typing Powered by UltraKey! Success comes easy with our latest award-winning software program. It's educational and fun! Discover the most efficient approach to learning and mastering typing fundmentals. If you want to improve typing skills quickly and easily, you can rely on Mavis Beacon. The latest version of the Family Edition is packed with features tailored for your individual success. The Family Edition includes 3 Licenses-Install and use on up to 3 computers. Manage up to 8 users with integrated family management tool and parent guide available only in the Family Edition. New! Typing Game Zone: Test your accuracy and brain power. Begin as a novice and master all six levels to achieve Wizard status. New and improved more user-friendly interface. Proven positive results in just eight hours of step-by-step instruction. User-friendly system for anyone from ages eight to 88. Set personal goals, celebrate your achievements and keep motivated through every step. Control how fast you go and what you do. 12 Interface themes and countless options adapt to your age, needs and style. 100+ Skill checks and typing tests measure your progress. 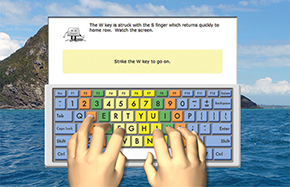 Designed by educators, Mavis Beacon Teaches Typing Powered by UltraKey uses a success-based approach to typing instruction. This powerful and motivating method sharpens new skills. You set personal goals and achieve them, one by one. Guided roadmaps aid your progress. Expert instruction, positive reinforcement and interactive games encourage you to type your best. Trust the #1 typing tutor for 30 years running. Give yourself a competitive edge. Improved typing skills will strengthen your professional work and personal hobbies. Success-based learning begins with setting a personal challenge level for speed and accuracy that you want to achieve as you complete lessons. A virtual model demonstrates correct body and hand position. Practice speed and accuracy with the Game Zone and timed typing tests. NEW! Knowledge Based Typing Games! Introducing the all-new typing game zone! The newest version of Mavis Beacon Teaches Typing has everything you need to type your best, including all new games! Take your pick of six different games. All will put your typing accuracy and knowledge to the test. Are you ready for the Typing Wizard challenge? Build your typing power as you progress through all six interactive levels. Windows Vista®, Windows® 7, Windows® 8, Windows® 10¹, Pentium® or AMD Athlon™ Processor, 1GB RAM, 980MB of free hard disk space, Video Card & Sound Card, DVD-ROM, keyboard & mouse, and speakers or headphones. Internet connection is required (Broadband Recommended)². Mac® OS X 10.8 – 10.12¹, Intel® Core™ Processor, 512MB RAM, 600MB free hard disk space, Video Card & Sound Card, DVD-ROM, keyboard & mouse, and speakers or headphones. Internet connection is required (Broadband Recommended)². ¹Administrator privileges are required to properly install the program on Windows Vista®, Windows® 7, Windows® 8, Windows® 10, and Mac® OS X. ²User is responsible for all Internet access fees and phone charges. *Minimum full display configuration is 1366x768. *High quality audio system or head set is recommended. © 2018 Bytes of Learning Incorporated. Created by Bytes of Learning in Canada. Published under license by Encore Software, Inc. Bytes of Learning, the Bytes of Learning Logo, UltraKey and the UltraKey Logo are the registered trademarks of Bytes of Learning Incorporated. Mavis Beacon and Broderbund are registered trademarks of HMH Consumer Company Limited, used under license. Windows, Windows Vista and the Windows logo are either trademarks or registered trademarks of Microsoft Corporation in the United States and/or other countries. Macintosh, Mac, Mac OS and the Mac logo are trademarks of Apple Inc., registered in the United States and/or other countries. All other trademarks are the property of their respective owners. USE OF THIS PRODUCT IS SUBJECT TO CERTAIN RESTRICTIONS AND LIMITATIONS OF WARRANTY UNDER THE LICENSE AGREEMENT CONTAINED HEREIN. YOUR USE OF THIS PRODUCT CONSTITUTES YOUR AGREEMENT TO ITS TERMS.